The Puzzle Lab is a new single-player game mode released as part of The Boomsday Project expansion. The content can be accessed via the Solo Adventures menu and is available for all players free of charge. The Puzzle Lab features a new format that deviates away from the format of previous Solo Adventures, like Dungeon Run and Monster Hunt. The Puzzle Lab consists of 120 unique puzzles with a range of possible objectives that must be achieved in a single turn. 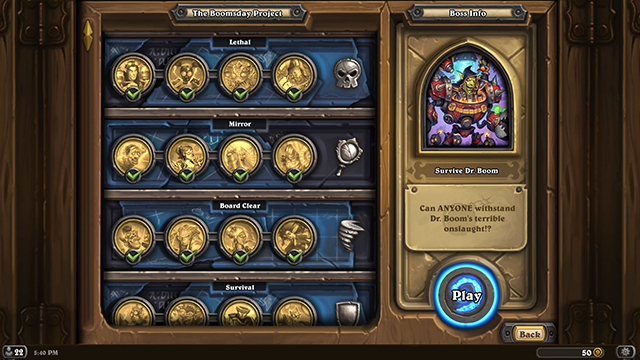 Each type of puzzle utilises a different skill, which often tie-in with those needed when playing normal Hearthstone games. The is no restriction on any of the puzzle types, allowing you to freely switch between puzzle types as you see fit. As you complete puzzles of a specific category, they will become progressively harder and will encourage you to switch to another category if you find yourself unable to figure out a solution. Within each category of puzzle, the puzzles will be separated into blocks of multiple puzzles, which represent helping a certain experimenter. When navigating the menus, you will be able to choose which experimenter you wish to assist, and this will determine the puzzle number you undertake. However, it should be noted that while you may stop and start doing puzzles in a block whenever you want, fully completing a block will force you to start from the beginning of the block if you wish to retry the puzzles. After you have completed all of the challenges in each category, you will get to face off against Dr. Boom himself, for an exceedingly difficult set of challenges. Upon first opening the game after the release of the Puzzle Lab, you will immediately receive 3 Boomsday Project cards packs. 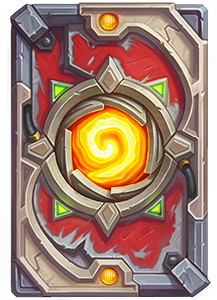 Additionally, after you have defeated all of the challenges, including those from the Dr. Boom, you will be rewarded with a special Puzzle Lab card back. 21 Aug. 2018: First iteration of the Puzzle Lab guide added.